In the photo taken by the Taiwan Central News Agency, the wooden tablet held up by two military officers with two lines that reads: “Souls of Republic of China Armed Forces Who Lost Their Lives in Papua New Guinea. On March 7, the Ministry of National Defense of the Government of Taiwan consecrated the Souls of Republic of China soldiers, who were buried in Papua New Guinea, to the Martyr’s Shrine in Taipei. 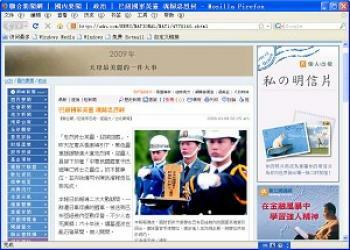 Media groups in both China and Taiwan have reported this event. However, the mainland Chinese media, because of political taboos, scratched out the word “Republic of China” in the photos completely. The photos on the Taiwan Strait Net of Mainland China are the same as any other websites’ photos, except that there was only one line of words on the tablet. Apparently, the Chinese regime’s media edited the photo so that the words “Republic of China Armed Forces” were scratched out, then removed the remaining words into the center. During WWII, a group of Republic of China soldiers captured by the Japanese were sent to Papua New Guinea as war prisoners. Many of them died there. The tomb was buried under rocks, debris and weeds for more than 60 years. The tomb was only recently publicized by the media, catching the attention of both mainland China and Taiwan.